We have tested just about every tee ball bat on the market. Our favorite is the Axe Origin Tee Ball Bat. We love the ergonomic handle, light swing and durability. All things that little kids and their paying parents want to see. In terms of sizing, the average 4 year old should swing a 12 ounce bat, 5 years old at 14 ounces, 6 year old a 16 ounce bat and a 7 year old in a 18 ounce bat. See our bat size chart for a full discussion. Three bats really fit the bill in terms of the Best Tee Ball Bat. There are, we note emphatically, a number of very good options on the market outside of these three, and frankly, it is hard to go terribly wrong with nearly any bat on the market. Few companies have put as much thought into their bat design as a Axe. And, to think, all that tech inside a bat for a little tyke is impressive. The bat uses an ergonomic design that improves swing mechanics. As well, it removes weight from the end cap by shaping it towards the performance side of the barrel. The asymmetric end cap drives a reasonable amount of weight away from the end cap and makes it an ultra smooth swing. See our Axe Bat reviews. If you are looking for something basic enough that swings light then very hard to go wrong with the Easton Beast X. See our lightest tee ball bat. Although full aluminum and a drop 11, we really like the Axe Hero for the ergonomic handle that encourages good swing mechanics. We discuss this at length in our Axe reviews. Worth checking out if your kid is comfortable with a slightly heavier tee ball bat. Quite frankly, it is difficult to find serious differences in tee ball bats. To be clear, we do not mean to imply tee ball bats are all the same. Rather, we tend to imply that there is very little chance any given tee ball player will see a difference by using any different bat. In theory, there could be tee ball player out there who absolutely rakes, and as such, would require a two piece end load or a single piece bomb dropper. As well, there may be a hitter or two that actually swings hard to enough off a tee to be disappointed in the hand sting an aluminum bat provides. He or she may want composite. 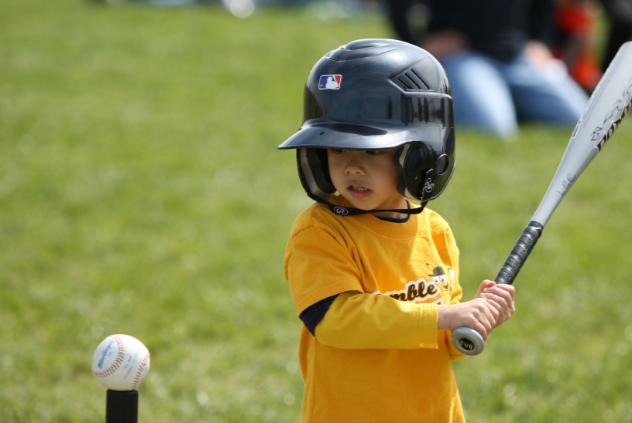 In reality, we doubt those kids actually exist on the tee ball scene—although some parents might beg to differ. The only real measurable difference in tee ball bats is the difference in their weight to length (aka, drop), and the different lengths those actually come in. Additionally, we think the bat handle on the Axe specifically gives an advantage. Other than those categories, we see no real differential between tee ball bats. Is It T-Ball or Tee Ball? We observe many folks searching for T-Ball instead of Tee Ball. On the internets at least, the terms are used interchangeably. However, as we see it, the Tee in Tee Ball is referring to the Tee the balls are hit from. Like golf tees, those are spelled Tee. Hence, Tee Ball and not T-ball. But, whatev. The best thing about the Eatson MAKO Beast is it is the only bat that comes in a 10.5 ounce range. Its composite structure gives it a drop 13.5. And at its shortest length, 24 inches, it becomes the lightest tee ball bat on the market today. The major disadvantage is the bat’s price point. As such, we suggest looking for last year’s model if you can find it on Amazon with a search like this. Do note that it comes in drop 14 version and a drop 13.5 version. Can I Use a Tee Ball Bat for Coach Pitch? We are often asked if someone can use their tee ball bat during coach pitch. The answer is, you can do whatever you want. Tee ball bats are not rated for major impacts. In fact, they are not rated for any pitch speed whatsoever, as the ball is stationary in tee ball. If you are seeing any pitch speed close to 30 mph, we would suggest a Junior Big Barrel Bat (aka JBB). With that said, these aluminum and composite tee ball bats can take a beating. We think most could get away with a tee ball bat for a very soft coach pitch league. Do not expect fantastic performance—although who needs fantastic performance at a coach pitch level anyway? Most just need a bat, and if they have the right size of tee ball bat, there is very little reason it would not serve the demands of a coach pitch game, too. While choosing the best tee ball bat, the real determining factor is weight drop. The drop, remember, is the numerical difference between the length of the bat in inches and the weight of the bat in ounces. For example, a 26 inch drop 14 weighs 22 ounces. Tee ball drops range from 10 to 14. There is a terribly long discussion about swing weights that would be appropriate for some. We refer you to our discussion on the matter instead of weighing down this article with information you likely don’t need when finding the best tee ball bat. After the drop, there are three broad categories of tee ball bats you may want to pay attention to. In this tiny person niche, we do not find them nearly as impactful as they are in bigger kid play. There are a couple of full composite tee ball bats on the market. Easton’s Mako Beast comes in a full composite as does Louisville Slugger’s 917 Prime and the Combat Maxum. Composite is a plastic material. Compared to aluminum, it can create better weight distribution. It is why composite bats in the tee ball space are the drop 13 and 14’s while the aluminum are more like drop 11 or 10. Although we did not officially confirm with Mizuno, they claim to make a two piece tee ball bat. According to their website, the Covert, which is a two piece bat in the big boy level, also comes in a two piece tee ball bat. If that is the case, it will be the only two piece tee ball bat on the market. Other two-piece bats at the upper levels, like the Easton MAKO and 917 Prime, are just single piece in the tee ball space. We see no advantage to a two piece bat at this level, although cool enough, we guess. It does help with the swing weight as the Covert’s drop on the tee ball bat is 13. Most tee ball bats are aluminum. These work well enough for most and are generally the least expensive. However, they often do not have the same light swing weight and run a drop 10 or 11. There are some, like the Easton speed series, that are a drop 12. On the whole, these are not our favorite tee ball bat construction—we like composite better. Lighter swings are almost always better in tee ball. But to each his own. And, as we state above, at this age it is hard to make the case it matters either way.